Even the simplest of polymer clay designs looks like a piece of art when it is framed in silver. Problem is, commercial silver bezels and frames are expensive and limited in shapes. Some polymer clay artists successfully make these parts themselves, but many are scared by the metal-working techniques, such as soldering, required for the typical process of creating a silver frame. In this tutorial, I will show you how to avoid soldering, yet be able to create silver frames in virtually any shape you can imagine. The tutorial explains how to use readily available commercial supplies to make your own flat and custom-shaped frames for polymer clay pendants. Examples shown in this tutorial demonstrate three different shapes of frames, with smooth and textured surfaces, and also with shiny and oxidized finishes. For your convenience, I am including instructions both for people who want to just try these techniques without a serious investment into professional tools and materials, and also for those who have these tools. 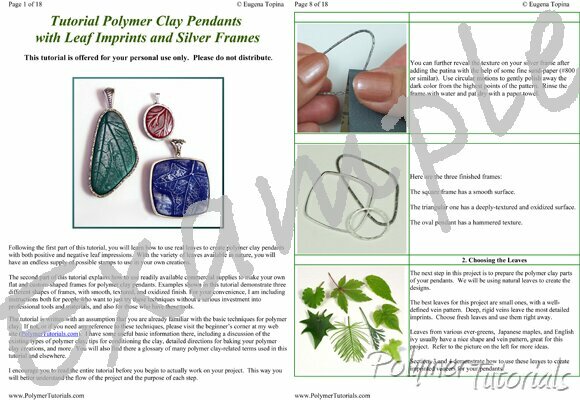 To complete the project, you will learn how to use real leaves in creating polymer clay pendants with both positive and negative leaf impressions. With the variety of leaves available in nature, you have an endless supply of possible stamps to use in your own creations. More than forty big full-color pictures showing every step. Place a mouse over the small pictures above to see it enlarged. Awesome ideas! Amy (Canada) ..